The ability to fly is one of the greatest miracles in the natural world. Millions of creatures soar above our heads today, using a fabulous variety of techniques to defy gravity and master their aerial environment. 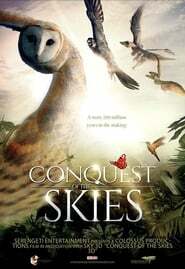 Wild Flight: Conquest of the Skies 3D uses the very latest science and stunning special effects to uncover the 300-million-year story of flight as never before. The most advanced filming technology allows us to show the beauty and excitement of life on the wing, from the fastest predatory falcons to the most acrobatic of insects, night flyers like owls and bats, and the soaring and gliding specialists capable of traveling huge distances. Audiences will truly enter the amazing world of these remarkable animal aviators, and leave the theatre both stunned by the spectacle and thrilled by the story of Wild Flight: Conquest of the Skies. The fourth in King Flex Entertainment’s documentary film series about racism.